Where to go cliff jumping in Jamaica? Other than the tropical weather, pristine white sand beaches, incredible food and breathtaking attractions, cliff jumping (some call it cliff diving) is another exciting feature of a Jamaican vacation. For those who are not aware of what sport entails, the name speaks for itself. Macmillan Dictionary defines cliff jumping as “the sport of jumping from a high place such as a cliff into water”. Now, this thrilling sport is not new. It is said that the sport can be traced back to the Hawaiian Islands approximately 250 years ago. The sport was a tribal tradition, where warriors were forced to jump feet first in order to prove their bravery to Kahekili II, King of Maui. While the meaning of cliff jumping has changed, the nature of the sport surely separates the boys from the men (no gender bias, ladies). The daring sport of cliff jumping is definitely not for the faint of heart! This is no joke! Since you are travelling from heights up to 35 feet, you are susceptible to bruises, abrasions, concussions, spinal damage and fractures! However, once you gain expertise for an experienced instructor, you’ll be equipped to conquer the cliff in no time! 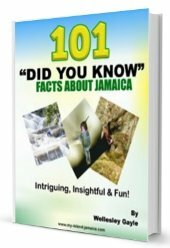 So, for the brave few who are willing to try the sport (that's not me) here are the two most popular sites in Jamaica where you can go cliff jumping - and this considers the many caverns, blue holes, rivers and falls in Jamaica. If you plan on staying on the western end of the island, then Rick’s Café should definitely be on your bucket list of places to go. The beautiful sunset, the musical entertainment and the amazing food makes it a must-go for the fun-loving vacationer. But many know of Ricks Cafe for its amazing 'cliff dives'. Fact: Did you know that Rick’s Café is ranked fourth on the list of scariest cliff diving spots in the world? Yes my friend! Their 35-foot high cliff is a lure for daring cliff jumpers who visits Jamaica from all across the globe! For those who are afraid of the 35ft depth, it may be comforting to know that you can start at a smaller height of 10ft, and make your way up gradually. 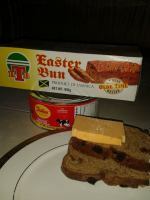 Read more on Ricks Cafe here. 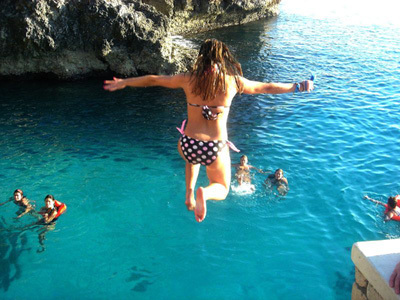 Just minutes away from Rick’s Café, The Caves is another favored spot for cliff jumping in Jamaica. Although not as popular as the one at Rick’s Café, The Caves is also a great option. The Caves, by the way, is a cozy hotel that offers accommodation, outdoor pools, a restaurant and a bar in a cave (yes, you read correctly) but yes, a convenient cliff jumping site. Similar to Rick’s Cliff, you can start at a lower distance and move up gradually, from as low as 8ft. So, if you are planning to stay at the The Caves hotel, consider taking the combo and experience the exhilarating sport of cliff jumping. Important. Please remember that this activity is highly risky, if you decide to engage in this activity do ensure that you take all the necessary safety precautions.